It is not difficult to come to the conclusion that there is something in Islam – or the practice of Islam – which inherently engenders hatred of all infidels. This story is about the sick hatred in the head of the LA Director of the Council on American–Islamic Relations. Of course the story is set in California and needs to be somewhat discounted also for mental instability. Needless to say that this “moderate” Muslim is an Executive Board Member of the California Democratic Party. 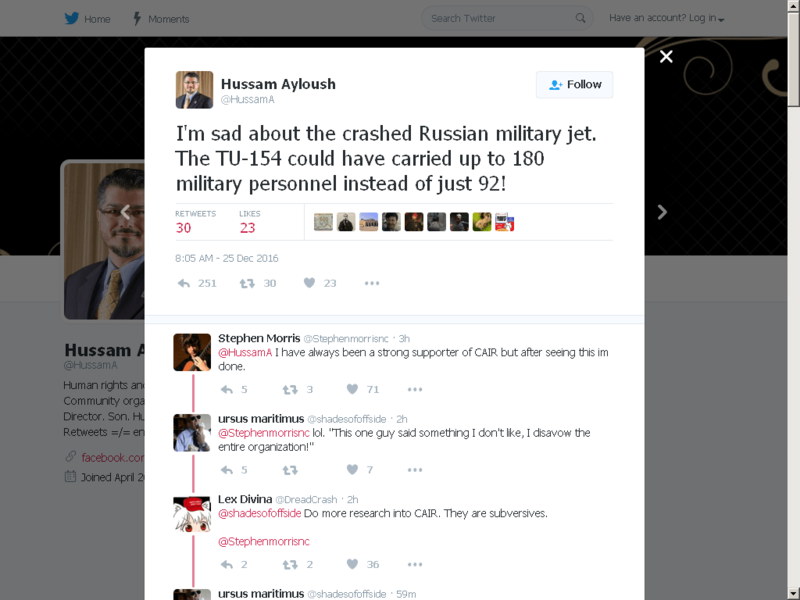 Hussam Ayloush, an executive board member of the California Democratic Party and executive director of the Los Angeles chapter of CAIR, publicly announced that he wished more people had died in the Russian military plane crash that claimed 92 lives on early Christmas morning. “I’m sad about the crashed Russian military jet,” Ayloush tweeted, before pivoting to a dark, twisted joke wishing the plane had more people on it. “The TU-154 could have carried up to 180 military personnel instead of just 92,” he happily declared. The Russian plane was transporting more than 60 members of the Alexandrov Ensemble, a well-loved army choir and dance troupe that performs folk music and popular songs. There were no survivors in the crash. Ayloush deleted his post after learning that the disaster had claimed the lives of non-military members.